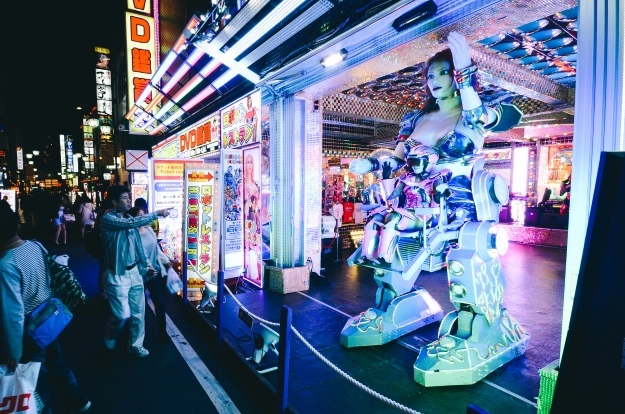 From Tokyo’s Robot Restaurant to the country’s very own rabbit island, there are plenty of weird and wonderful things to do in Japan on your next holiday. Futuristic cities and wild landscapes hide some of the most remarkable attractions in the world, embracing modern art and allowing visitors to get up close and personal with some of the cutest animals on the planet. In the mountains near Shiroishi, south of the city of Sendai, six different types of foxes live and play together. Zao Fox Village is one of the best places in the country to see foxes, which roam freely around the preserve and are familiar with humans. Upon entering the village, visitors can buy food for the foxes and get up close to these remarkable creatures which play a prominent role in Japanese folklore. 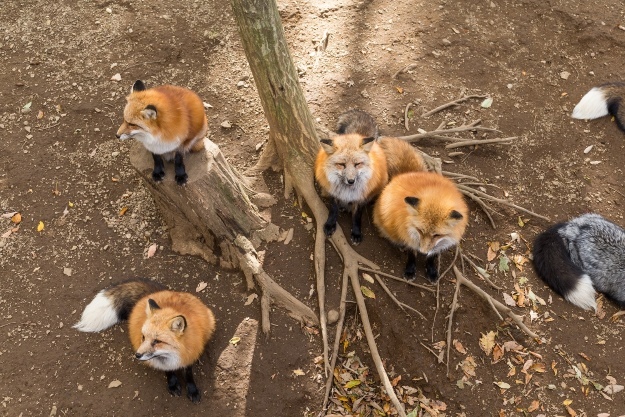 You can visit the fox village easily from Tokyo. 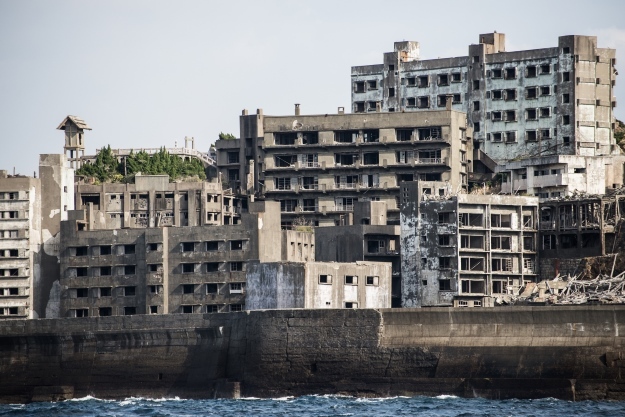 Hashima Island, commonly known as Gunkanjima, lies abandoned 15 kilometres from the city of Nagasaki. The island, likened to a fortress, is surrounded by a seawall with high-rise buildings jutting out from behind. In the early 1900s, Gunkanjima was developed by the Mitsubishi Corporation, which believed that the island was sitting on a rich submarine coal deposit, according to Atlas Obscura. For the next hundred years, the mine expanded, stretching out underneath the seabed to harvest the coal that was powering Japan’s industrial expansion at the time. Incredibly, by 1941, Gunkanjima was producing 400,000 tonnes of coal every year. The now eerie buildings accommodated the miners. Blocks of flats were built up on the rock, crammed together to utilise the tiny amount of space. Schools, gaming houses and restaurants were built for the residents. By the mid-1950s, the island housed around 6,000 people. Eventually, the coal ran out. Mitsubishi closed down the mine and the people left, leaving Hashima Island to sit in silence. Today, tourists can visit the island, now a UNESCO World Heritage site, by taking a short boat ride from Nagasaki Port. Tour boats are operated by multiple companies. The firefly squid may be small, but they are certainly among the most incredible creatures to see in Japan. At the end of their tentacles are special organs called photophores which light up like glow sticks. Toyama Bay is the best place to catch a glimpse of these alien-like fish. Although the squid usually live 1,200 feet underwater, Toyama Bay’s unique shape means the current pushes the creatures to the surface, revealing a glistening blue glow. Fishermen begin harvesting firefly squid in March and stop in June. To see the ethereal blue glow for yourself, you can head out on a boat in the fishing port at around 3am. For more information on these late-night tours, visit the Hotaruika Museum website. 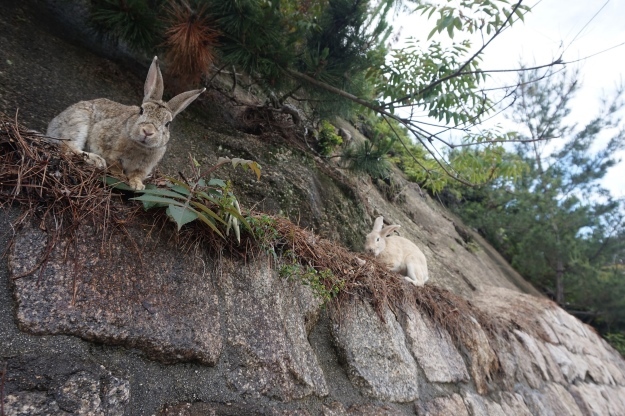 Fluffy bunnies run amok on the island of Okunoshima in the Inland Sea of Japan. Visitors frequent the island to be cuddled by these loveable animals, but the history of this unusual attraction is more sinister than many realise. During World War II, Okunoshima was used to produce chemicals to be used in combat. The rabbits may have been brought to the island to test the effects of these poisonous gasses, and freed once the war ended. Another myth claims that in 1971, schoolchildren brought rabbits to the island where they eventually bred, leading to their current population which is in the thousands. Margherita and Nick, creators of sustainable nature and adventure travel blog The Crowded Planet, visited Japan in September 2016 for three weeks exploring Tokyo, Kyoto and Hiroshima. “Okunoshima was so much fun!” said Margherita. “We wanted to go to one of the cat islands, because we both really love cats, but we decided to head to Japan’s Rabbit Island, once we saw that the cat islands were hard to get to. After all, rabbits are almost as cute as cats! “I love visiting unusual places. 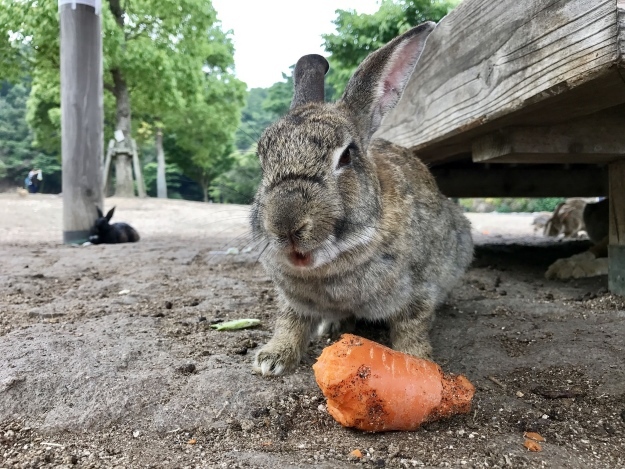 When I heard there is an island in Japan that is populated by rabbits, I just had to go. My expectations were quite low – I thought I might see a few bunnies, if I am lucky. In hindsight my trip to Okunoshima was like entering a childhood dream. I didn’t see just a few rabbits, I saw hundreds of bouncing fluffy bunnies of all different shapes, colours and sizes. I literally couldn’t cope with the cuteness. But it wasn’t just the rabbits that fascinated me. 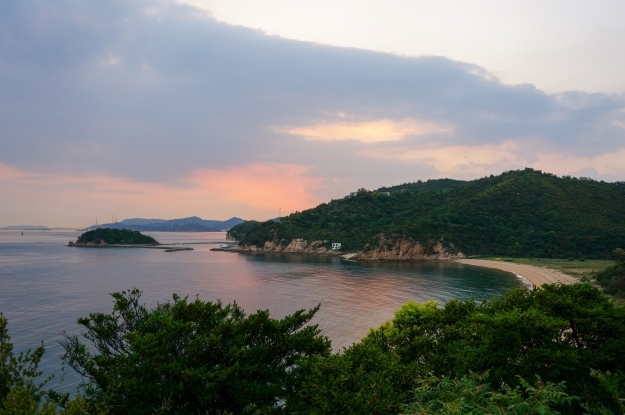 The island has also some stunning white, deserted beaches and great viewpoints over the Seto Inland Sea. Just 55 miles south of the city of Osaka sits Japan’s largest cemetery. 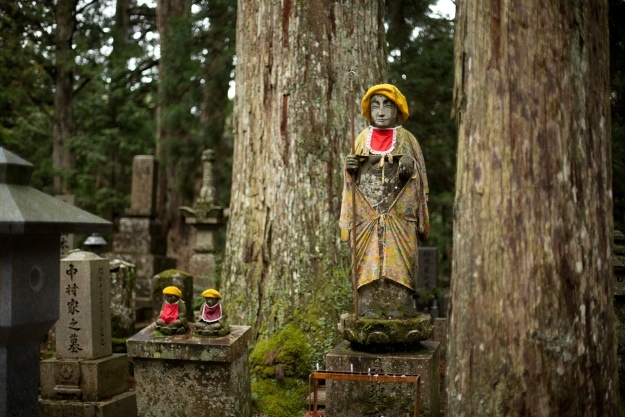 In the forests surrounding Mount Koya, the cemetery is eerily beautiful, with monuments sat atop gravestones. Okunoin is the site of the mausoleum of Kobo Daishi, the founder of Shingon Buddhism, making it one of the most sacred places in Japan. The Ichinohashi Bridge (first bridge) marks the traditional entrance to Okunoin and visitors are expected to bow to pay respect to Kobo Daishi before crossing it. Once inside, the cemetery’s 200,000 tombstones will be revealed. The stones follow a two kilometre approach to the mausoleum. Artworks are scattered all over the island of Naoshima, hanging on clifftops and perched on the shoreline. Many of the works were donated by the Benesse Corporation and others have added their pieces to the venture to help it thrive as an artistic hub. Tourists can hop on the ferry from the mainland to reach Naoshima. In the 1980s, the chairman of Fukutake Publishing was searching for a home for their corporate art collection. Rather than opting for a museum in Tokyo, the chairman decided to see if the islands he remembered from his childhood might benefit from the collection. Years later, with the help of architect Tadao Ando and support from the local community, Benesse Art Site was born. 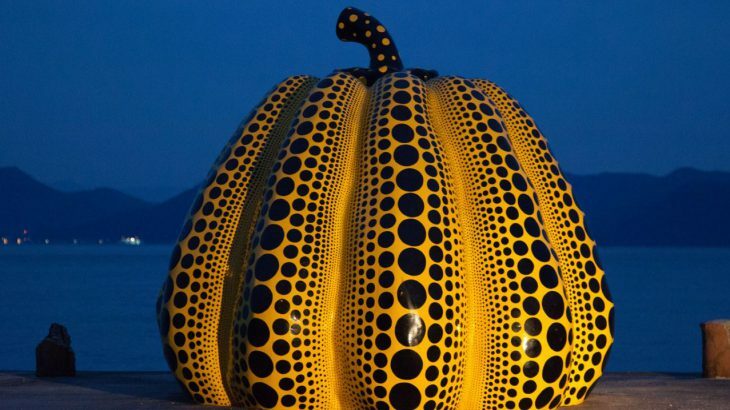 With so much to see at Benesse Art Site, we asked Jen to tell us about some of the highlights: “Definitely Yayoi Kusama’s yellow pumpkin installation. We had seen photos of it, but to visualise it in person with the smell of the ocean and soft beach around it was amazing. We visited the installation at dusk, which I’d definitely recommend. Learn about the history of ninja stealth and skill at the Ninja Museum. Located in the city of Iga in the central Kii Peninsula (55 miles from Osaka), the museum guides visitors through the history of the ninja through artifacts, secret passages and demonstrations. It’s believed ninjas were established during the medieval Sengoku period in the mid-15th century. Often described as being somewhere between a spy and a mercenary, ninjas gathered sensitive information and performed assassinations. This interactive museum is perfect for those interested in discovering this unique aspect of Japanese history. Known as ‘Kyoto’s Kitchen’, Nishiki Market is a narrow, five-block shopping street with more than a hundred shops and restaurants. 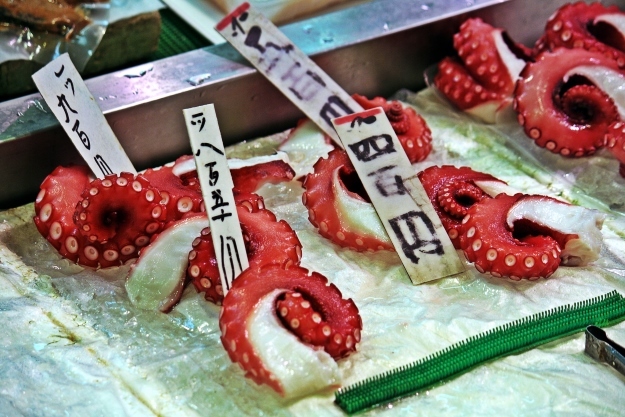 Originally a fish wholesale district, this is the place to be if you’re looking for authentic Japanese cuisine, particularly sweets, pickles, dried seafood and sushi. As many of the local foods are difficult to identify, the stallholders are more than happy to give out samples. If you find something you like, there are plenty of places to sit down for a meal. Nishiki Market is an assault on the senses, in the best possible way, so it’s highly recommended on a visit to Kyoto. Margherita of The Crowded Planet loved visiting Nishiki Market and kindly told us about her experience: “Can I just summarise everything with one word – YUM! Just kidding. The only other market in Japan we had been to before Nishiki was Tsukiji, and the two markets couldn’t be more different! Tsukiji is just mental, whereas Nishiki is slow and calm – a bit crowded, yes, but much less frantic. Dine in a restaurant staffed by ninjas at Ninja Akasaka. Guests can step four centuries back in time and dine in Edo period style. At this time, ninjas were spy warriors, recruited to perform assassinations and gather information. Visitors can order their food from scrolls as the waiters disappear into the darkness. The trained ninjas reappear out of thin air with the dishes, entertaining guests with martial arts demonstrations. Ninja Akasaka can be found in the district of Nagatacho in Tokyo. 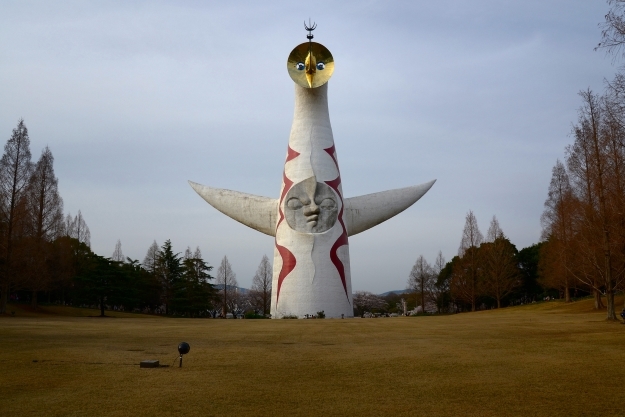 During Japan’s Expo ’70 (an international exhibition held in Osaka in 1970) the Tower of the Sun rose proudly from the huge tent surrounding it. After decades of neglect, the unusual sculpture has been refurbished and is now open to visitors. Standing at 230 feet, the tower is the work of artist Tarõ Okamoto and was built to represent the past, present and future. It’s said that the golden face at the top represents the future, the segmented face in the centre represents the present, and the mysterious face on the back of the structure represents the past. Around 70,000 trees once lined the shore of Rikuzentakata, however only one remained after the 2011 tsunami. Today, it is known as the miracle pine. The tree, which stands at 90 feet and had until recently lived for 200 years, could not survive the saline content in the earth after the tsunami, and died 18 months later. A sculpture was erected in 2013 to return the tree permanently to the shoreline, formed over a metal mold. 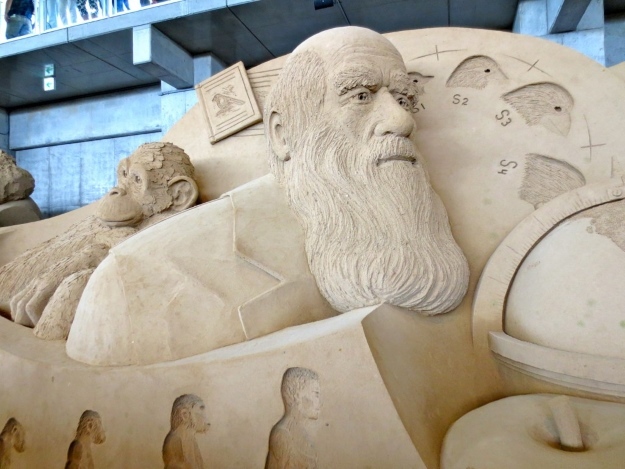 Carved from 3,000 tonnes of sand, this remarkable museum creates sculptures of famous buildings, people and artworks. The Sand Museum sits in Tottori, a coastal city famous for its 10 miles of sand dunes. As the beach is so popular, the city decided to capitalise on this by creating the museum. The first exhibit was based on the work of artists including Leonardo da Vinci and Michelangelo and opened in 2006. By 2012, the yearly exhibit was moved to a permanent home. The sculptures stand from mid-April to the following January, before they’re destroyed to make way for new ones. 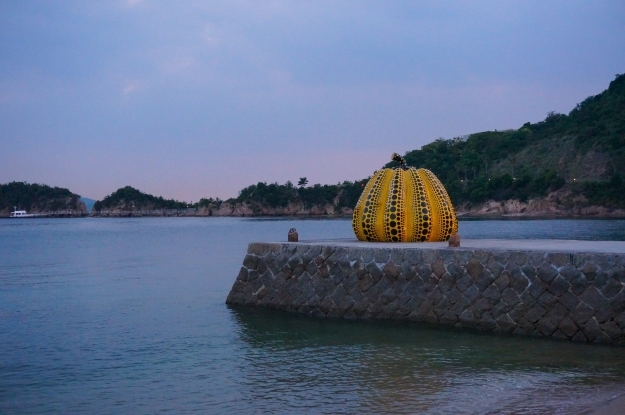 If you’re travelling by bus on your holiday to Japan, you may just stumble upon Nagasaki’s fruit shaped bus stops. Wait for your transport in a giant melon, strawberry or orange in the town of Kongai. The fruit stops, originally built as part of a 1999 expo in Osaka (450 miles away), became incredibly popular and were replicated in other parts of Japan. During the Edo period (1600 to 1868), courtesan culture arose, leading to the introduction of the oiran. Although oiran were considered a type of yujo (‘woman of pleasure’) in these times, they were entertainers and many became celebrities, praised for their fashion. This fascinating part of Japan’s cultural history is still very much talked about today, and travellers can take the opportunity to learn more about the lives of the oiran on their trip to the country. “We love how well-organised and efficient everything is,” said Cory. “The food is fantastic, the service is the best and we like the cityscape. Most importantly, we love the quirks of Japan, starting with the Japanese love for anime, through their passion for visual merchandise, to incredible technological advancements. Locals in the small town of Inakadate have been growing rice for over 2,000 years. Until 1933, this was pretty much all the town was known for. 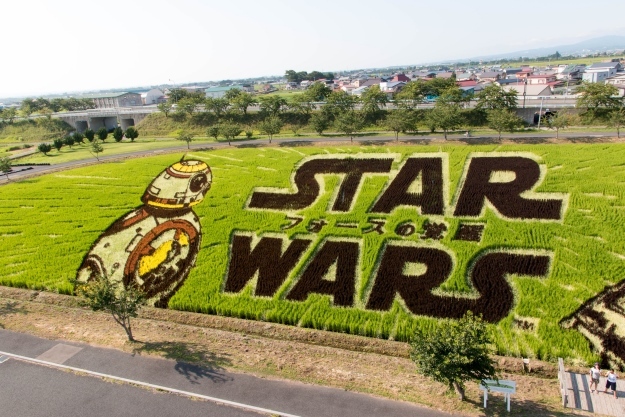 But the townspeople had an idea to bring in tourist revenue and to drum up interest in Inakadate – they began creating artworks in the rice paddies. Using techniques based on their knowledge of agriculture, and modern technology, the locals created impressive pieces of art featuring a whole host of subjects. Although it’s a huge amount of work involving over a thousand locals, the results are spectacular, stretching hundreds of feet across the fields. Just over 80 miles from Tokyo sits one of the world’s most famous natural sights, Mount Fuji. This iconic volcano is surrounded by an area known as Fuji-Goko or ‘Fuji Five Lakes’. The cluster of lakes around the northern edge of Mount Fuji provides a haven for swans. Thus, this weird and wonderful Japanese attraction was born. 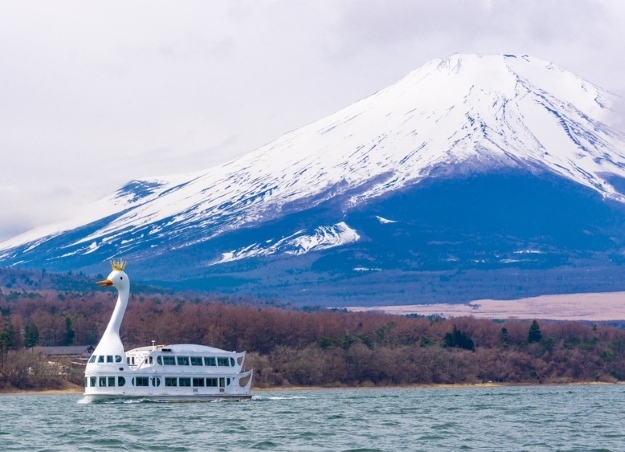 The swan ferry boat carries passengers around the largest of the five lakes, Lake Yamanaka, offering unbeatable views over the volcano. On your tour of Japan, you absolutely cannot miss out on trying its national dish – ramen. But you should also check out the museum dedicated to ramen. Celebrating all things noodle, the museum leads visitors through the history of this unique dish, which actually originated in China. Expect to see ramen advertisements from throughout the ages, vintage ramen memorabilia and interactive displays showing you how instant ramen factories work. Of course, you can also tuck into a bowl of tasty ramen at the museum. Japan is a fascinating country to visit in every respect. Its unique culture and willingness to embrace the futuristic and eccentric has made it one of the most exciting places in the world. Have you visited any of these weird and wonderful attractions? If so, we’d love to hear your recommendations! Japan Japan, nature, top things to see, wildlife. permalink.